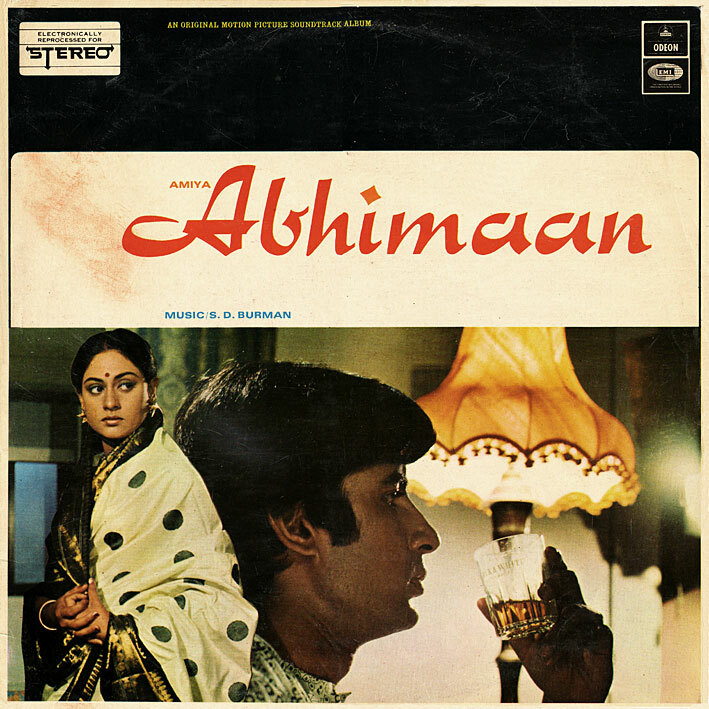 'Abhimaan', a moderately charming Burman Sr. score. The songs are quite pretty and pleasant I guess, 'Meet Na Mila Re Man Ka' probably the best one, but it's not an album I'm able to get very excited about. Hope some of you like it though. Actually I like most of the songs mainly because they are good examples of good semi-classical tunes. Probably my favourite tracks are Piya Bina and also Nadiya Kinare. Thanks for this - I have the CD but it will be interesting to hear if the vinyl is clearer than the CD! Totally awesome. I just got into Bollywood movies and this blog is great for us newbies. Again, THANKS! I love this album especially teri bindiya re... I also have this record. Curiously, RD Burman's 'Hum Kisise Kum Naheen' from 1977 (to be posted soon) has one side in stereo and the other in mono - very odd. Rapidshare link no longer active can you re-up please?? Still waiting for a reup for this, if anyone is kind enough to do so. Please Reupload the ALBUM, Eagerly waiting for it. I general, albums won't be reuploaded. Once they're gone, they're gone. It's the nature of things, otherwise I'd have to make this a life long project, continuously reupping everytime a link expired. Sorry. Thanks for responding and it is totally understandable. As it is you have done more than enough by putting this treasured music out here for all music lovers to get and it is appreciated beyond measure. However, as someone who recently came across your blog, I have been going through it picking out the music and as it so happens this and one other album (Honeymoon) are the only ones that I have found with links gone dead and was hoping any kind soul who might be reading this and may have the album to re-upload it. I also noticed that these 2 albums were not uploaded on to multiple upload sites like all your later uploads hence the shorter lifetime for the links.